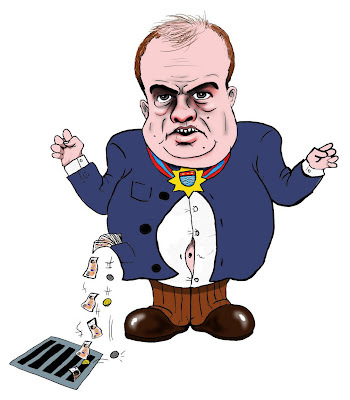 As Brian Coleman prepares to face Barnet Council’s Standards Sub-Committee this morning for calling "three times a night" blogger Rog T an obsessive poisonous liar, it seems that even the Conservative Mayor of London, Boris Johnson, is tiring of Coleman’s rampant snout-in-the-troughism. Mayor Watch reports of a heated exchange at yesterday’s Question Time. Cllr Coleman had called on the Mayor to implement deep spending cuts. Boris responded by suggesting that “those calling for cuts in expenditure while in receipt of more than one GLA salary might want to think about giving up one of them”. This was a clear reference to the £25,687 a year Coleman receives as Chairman of the London & Fire Emergency Planning Authority (LFEPA), in addition to his GLA allowance of £52,910. Mr Coleman also attacked David Cameron by claiming that the Conservative Leader’s proposals to cut MPs pay and perks were “silly, trifling nonsense”. Like the silly £5,130 Coleman receives for chairing the National Joint Council for Local Authority Fire & Rescue Services, or the trifling £10,266 for chairing the LGA Fire Service Management Committee. And all of that is before you include his allowances as a Barnet Councillor. Brian Coleman’s position on LFEPA was the gift of Boris. As the saying goes: what Boris giveth, Boris can taketh away. Yes. I thought the open hostility between Mayor Johnsion and Mayor Coleman was extraordinary.